Dracovenator: A new Beipiaosaurus - beautifull plumage! We're just under a fortnight into the new year and already the new dino papers are stacking up. The DML brings news of Ceratonykus a newly named alvarezsaur. And PNAS have published a short paper on a stunning new specimen of the therizinosaur Beipiaosaurus. This specimen is much less badly fragmented, than the holotype but sadly still only consists of the front end of the skeleton. It gives us all sorts of new details to mull over. First and foremost are the weird large single filament feathers that line the neck, back and tail (present in the holotype but not the new specimen). This fossil combined with last year's Epidexipteryx is showing us that a diversity of feather forms, now extinct, evolved before the pennaceous feathers that dominate modern birds plumage. In this case the feathers take the form of stiff, single filaments, that are about 2mm in diameter. The authors call them EBFFs (Elongate Broad Filamentous Feathers) but I will simply call them 'quills' and I really wonder whether they had some spiny defensive function. The apparent lack of any modern style pennaceous feather, with a central rachis and rows of barbs on either side, does suggest that therizinosaurs are not so closely related to oviraptorosaurs (which have pennaceous feathers in spades) as once thought. This does back up recent analyses based on skeletal anatomy which have not been returning an oviraptorosaur-therizinosaur clade of late. Furthermore these quills bear more than a pasing resemblance to the structures of the tail of the ceratopsian Psittacosaurus. The authors suggest what I guess a great number of us have wondered: did feathers evolve much earlier in archosaur history than we currently recognise? Of course the complete skull alone is reason enough to make theropodophiles drool. Intriguingly it appears quite derived (it acyually looks like a little Iguanodon, oops that should be Dollodon skull) which indicates that cranial modification occured earlier than some of the postcranial modifications that therizinosaurs are famous for, e.g. the re-enlarged hallux, or big toe. Other cool details include the outlines of a throat pouch, a feature that seems to have been reasonably widespread amongst dinosaurs. 2009 is shaping up to be a good year! Lovely! Thanks for pointing this out. I'm reduced to buying field guides for dinosaurs because there are too many to keep straight. The feather variation confirms the evolutionary pattern of "branch & prune, branch & prune." Are there labels for the diagrams? Nah, These things on Beipiaosaurus aren't collagen fibres. 1) they are stiff (look at the yellow arrowed structures in the figure), 2) They project beyond the body, 3) At 2 mm wide I think they are too wide to be collagen fibres. I'm a systematist working on dinosaurs and I'm having trouble keeping up with the welter of new dinosaurs being published around the world. 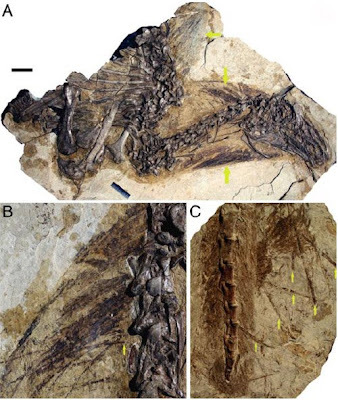 The caption for the figure is in the paper, basically the top image is the new specimen, B, is a close up of its neck region and C is the tail of the holotype. The yellow arrows point to the quills. Is it possible they look like pinfeathers because they *are* pinfeathers (feathers that have not reached their fully unfurled form)? Ceratonykus? A horned alvarezsaur, perhaps? This is really a beautiful new fossil. I think the quills look quite a bit different than those of the famous Psittacosaurus specimen. For one thing, the parrot lizard's quills are extremely elongate and flexible. Still, I wouldn't be surprised if some sort of external integument were present in all ornithodirs. And no Zach, Ceratonykus is named for its carpometacarpal spurs. Who knows what they are homologous to (if anything), since the paper's in Russian. Well, I saw an interesting talk at SVP last year suggesting that the theropod hand went from I-II-III to II-III-IV based on a new toothless ceratosaur which seems to show a highly reduced digit I. That SVP talk did look to be the most interesting of the conference. Btw, was the ceratosaur the same thing that had previously been identified as an ornithomimosaur (several overlapping skeletons)? Ceratonykus' spur may be digit I, but that would be an atavism if it was lost at the base of Tetanurae. Maybe that's why the authors question alvarezsaurids' placement within Theropoda. ;) I'd expect it to be a neomorph like modern birds' carpometacarpal spurs (some are bony, right?). I'm a blogger virgin, but this new Beipiaosaurus is just too exciting! I'm a palaeo-artist in Melbourne, Oz, and am working under the direction of Hailu You on some large paintings of Chinese dino faunas. I went to China with Hailu and Jim Kirkland to see the Jehol biota a few years ago - amazing, although I didn't get to see the Beipiaosaurus holotype, darn it! I'm a zoologist by training, but only broadly knowledgable about dinos, not specifics - cladistic analysis still baffles me, for eg, although I like the approach. I've done dino murals and other artwork for the Melbourne Museum and Monash Uni, and written and illustrated several dino books for kids. I'm pretty serious about my artwork, but often can't find the info I need. Can I sometimes pick your brains for info/theories/speculation/outright guesses? Thanks, Andrew.